Culture Minister Miri Regev accuses left of attempting to drive wedge between Israel and minorities to bring down the government. Culture and Sports Minister Miri Regev addressed the investigation against her father and the controversy surrounding the Nationality Law in an interview on Nissim Mishal's 103FM program. Regev's father was questioned on suspicion of selling fake alcohol at his workplace. Police raided a warehouse he owned and found 1,500 fake bottles. Regev's father and his partner were released under restrictive conditions. "I am very fond of my father. He is a decent, honest and naive person who has worked hard throughout his years to support our family and has always said that we have to make a decent living and every job respects its owners," Regev said. . "Unfortunately, my father and his partner fell victim to a crook who sold them fake alcohol without their knowledge. My father and his partner had a business line for drinks that they operated for many years in the south. Only during the police investigation did they understand that the alcohol is fake." Do you know that fake alcohol caused the deaths of six people and three others were blinded? "My father and his partner have cooperated fully with the police and I call on them to finish the investigation as much as possible and to get their hands on those crooks who sell fake alcohol to businesses. I'm sure that at the end of the interrogation my father and his partner will [be shown to have] known nothing, that they spoke the truth and are white as snow. I really love my father and believe in his credibility." "My father and his partner have cooperated fully with the police and I call on them to finish the investigation as much as possible and to get their hands on those crooks who sell fake alcohol to businesses. I'm sure that at the end of the interrogation my father and his partner will know nothing, that they spoke the truth and are snow-white, I really love my father and believe in his credibility. " How did you find out about this? "You will not believe how I found out. I learned this through friends who heard him on the tape, which was recorded without his knowledge, and thought it was my father. I could not even imagine this story. On Friday, I called my father and he said to me, 'Miriam, do not worry, come to Israel, and we'll talk. I went back to Israel and immediately sat with him. They called him from the media, recorded him and asked him if he knew it was a criminal act and he admitted in his innocence that he did. He was so naive, I told him to look at what I was going through with the media and not talk to anyone. They called him not because they are interested in what is happening with him, but because he is my father." What is he doing now? Did he go back to work? "No. He sold [the business] in December. He takes care of himself and my mother." Are these difficult days for you? "No, nothing is difficult. Why should it be difficult? My father said plainly that he did not know anything and fell victim to the crooks. He said everything he had to tell the police. That's the truth." The media did not make it as big a story as you thought. "I do not think so, they also apparently understand that he was a victim, apparently there is a network of crooks selling fake alcohol, and my father fell victim to this deception. I have to put my hand on those crooks who sell fake alcohol and at the same time it turns out that my father and his partner spoke the truth and knew nothing. My father worked very hard all his life, and it hurts to find out that they were working on him and that in his innocence he fell for it." On another subject, the prime minister unexpectedly announced the cancellation of his trip to Colombia because of the situation in the south. What do you need to understand from this? "I do not think we have to think that tomorrow morning we are embarking on one operation or another, but the prime minister understands the security complexity in the south. Colombia is very far away, and his ability to hold a different diplomatic visit to Colombia as opposed to Europe is why he made the decision that in the current situation it is wrong for him to go to Colombia." Will the deterioration in the south necessitate the prime minister remaining in Israel? "I don't know. I am not a member of the cabinet. I do not talk to him about security issues, and I do not intervene in issues that are not under my responsibility and authority. It is no secret that the south has recently been in a difficult and very complicated security situation. Just now the defense minister made the decision to prevent the supply of fuel and gas to Gaza. Hamas uses women and children in mosques and hospitals, it uses everything possible to terrorize and this is nothing new." Is it time to strike Hamas leaders and return to the policy of targeted assassinations? "Hamas's terrorist leadership cannot feel secure while parents are unable to send their children to the class because they do not know what will happen, and I unequivocally say that we must return to the policy of targeted assassinations. The equation should be simple: If a child in the envelope Gaza can not sleep quietly at night - Hamas leaders do not need to sleep quietly at night, nor can they constantly try to escalate the situation and try to harm our citizens every time." Let's talk about the Nationality Law. The fact that the prime minister is now making improvements and trying to appease the Druze does not mean that the law was fundamentally problematic and not good? "Of course not. The Supreme Court makes its decisions on the basis of the Basic Laws and the National Law complements the Human Dignity and Liberty Law." The Nationality Law does not contain the word 'equality.' They tried to sell it to the Druze and it is not true. "Between the Jordan River and the sea, there are national rights only for one nation and this is the Jewish nation. This state is a Jewish state and there is no need to apologize for it." Does the word 'equality' interfere with Jews? "No, there is a difference here between national rights and the rights of the individual, and individual shave full equality and full rights, as it appears in the Law of Human Dignity and Liberty. The Nationality Law makes it clear that the State of Israel is the nation-state of the Jewish people. The left is looking for anything to bring down this government, and they have tried to conduct a publicized campaign here to try to influence the Druze to come out against the State of Israel." For you the left is always at fault. "The Druze themselves say they recognize that the State of Israel is the nation-state of the Jewish people. They need a special status, no problem. The prime minister came up with an excellent compromise, and I am glad we reached an agreement acceptable to them." Jabotinsky and Menachem Begin are leftists? They themselves spoke of a state of the Jewish people with a commitment to full civil equality for minorities. "The Basic Law: Human Dignity and Liberty allows equal rights for all and the Nationality Law that says that this state is the state of the Jewish people, that it has one anthem, one flag, one language and one capital - Jerusalem. Anyone who reads the law understands that this law deals only with national rights and that the State of Israel has only one nationality." 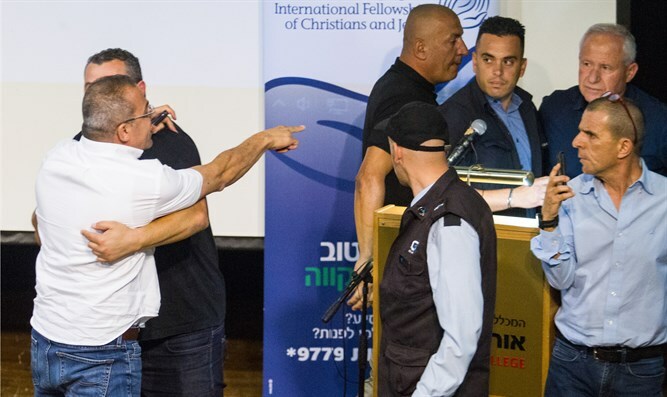 What do you think of Yuval Diskin, former head of the Shin Bet security service, calling on the heads of the Druze community to reject the prime minister's proposal and continue the struggle? "He is part of those inciting elements who are trying to create a quarrel between us and the Druze, and I sincerely hope that the leaders of the community will not listen to these and other statements, but will go with their truth and the legacy of their grandparents." Are you going to the demonstration on Saturday night? "I go to visit the Druze all the time, and on October 2nd, we are planning a big salute event for the Druze community as part of the 70th anniversary of the State of Israel, which was set up a few months ago. We respect the Druze community and it is very unfortunate that the group of extremists tried to shake this fact." All because of the Left? "Not everything, but the left, wherever possible, puts a barrier between us and such sectors and the others in order to overthrow the government." Enough of these slogans. Should not the government be overthrown politically? "It is legitimate to remove the government at the ballot box, but this will not succeed. The public knows the truth. It has an excellent government and an excellent prime minister. It will not work for them. MK Tzipi Livni knows this Nationality Law even when Avi Dichter was with her, and this law has been in place for many months now in the Knesset. Now she suddenly talks about the Druze. She is allowed to talk but she has some respect for herself, Not everyone who changes his opinion also changes his position. When you have a real agenda, you have to talk about it. But we all know who Tzipi Livni is and know that she has no real opinions. When a politician changes parties like he changes socks - it shows something about himself." Let's talk about Miri Regev, what is it about you that attracts fire so much? How did you become a controversial woman? "I do not think I am controversial. Most of the public supports me. I am a person who does, works and goes with his own way and I also treated the elites when I came and opened the Ministry of Culture budget book. I do not believe in two states for two peoples, neither on the state nor on the budget issue." In a film prepared by Amnon Levy, he called you a "walking provocation." Does this have something to it? "When someone from the left shouts, he is considered assertive, when someone on the right shouts, he whines. It's all stigmas. There's a kind of tolerance toward people from the left, I decided to go with my own truth and my own way. I had to shake things up and that's what I've done in recent years. There are budgets for both the East and the West." Are not you hurt by the image that was built for you? "I'm considered a bulldozer. It's a good thing. Not even Trump says he's a bulldozer. I'm considered one of those who do and act [like] when I called the left to tell the truth and stop talking in fixed slogans that have nothing to them. I have never known that my grandparents were pioneers in this land. It is time to say that both Migdal Haemek and Afula are pioneers like Nahalal and Kinneret. " In conclusion, are you still a good friend of Sara Netanyahu? There were rumors of tension. "I am a good friend of hers and of the prime minister, and I am very honored that the prime minister is a great leader who opens doors, and Sarah Netanyahu is a good and smart woman who does her social and professional work."